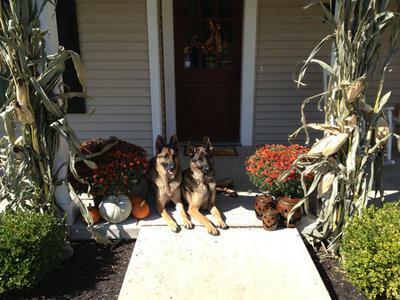 I am sending this fall picture of our two German Shepard Dogs. They definitely love to have their picture taken. They both love the kids, cats (3) and our other dog Chico the chihuahua. Both dogs are very active, Sampson loves to play with tennis balls and Delgado favorite is a softball. Our daughter Alexandra hits the balls to them for hours at a time every day. We are constantly doing landscaping and outside projects they love to be outside and are by our sides any chance they get. We have a community toy bucket in the corner of the dining room and the main goal is to empty it out daily and take inventory of their endless toys. They are both so lovable and show it to our family each and every day. We are truly blessed to have them in our lives. German Shepard’s Rock! It sounds like you are providing a great home for them and in return they are giving you wonderful companionship - sounds like the perfect swap to me. Continued success with your boys! They are truly 2 wonderful examples of the German Shepherd Dog breed.